This easy video tutorial is the fastest way to master modern data science best practices and use them to promote timely, evidence-based decision-making! Applied Data Mining LiveLessons demystifies current best practices, showing how to uncover hidden patterns and leverage them to improve all aspects of business performance. 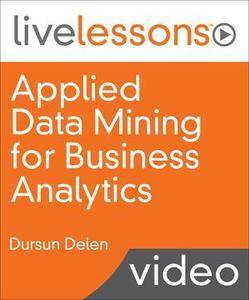 Drawing on extensive experience as a researcher, practitioner, and instructor, Dr. Dursun Delen shows you exactly how analytics and data mining work, why they’ve become so important, and how to apply them to your problems. Delen reviews key concepts, applications, and challenges; introduces advanced tools and technologies, including IBM Watson; and discusses privacy concerns associated with modern data mining. Next, he guides you through the entire data mining process, introducing KDD, CRISP-DM, SEMMA, and Six Sigma for data mining. You’ll watch him demonstrate prediction, classification, decision trees, and cluster analysis…key algorithms such as nearest neighbor…artificial neural networks…regression and time-series forecasting…text analytics and sentiment analysis…big data techniques, technologies, and more. In just hours, you’ll be ready to analyze huge volumes of data, discover crucial new insights, and make better, faster decisions!